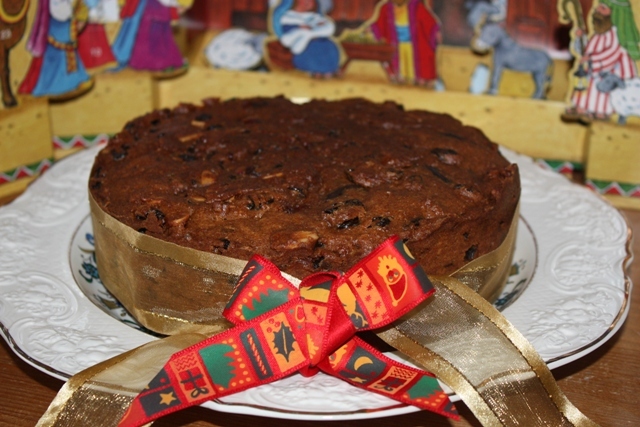 Herewith - belatedly - my vegan Christmas cake - it's boozy, fruity and utterly yum. I made it yesterday with a little help from two of the kids. I've been making this cake for years and I always get comments from people who've made it, so please comment! 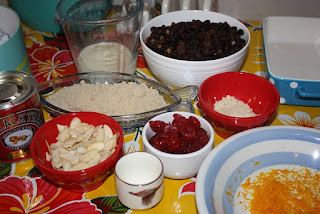 This year I am taking part in my friend Emily's Advent Linky Party with this recipe. See the Craft Advent/nest button over on the right and click to learn more. It helps hugely, I find, to get all your ingredients weighed and ready in advance. This recipe makes a lovely moist cake; we used it as our wedding cake last year. We eat it plain but you can buy vegan marzipan and icing to decorate it if you like. Nuala, this looks and sounds just gorgeous! I don't like dry fruit cakes at all, so the fruity moistness seems to be right up my street! 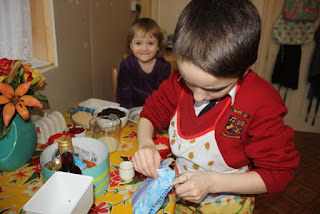 Thanks for linking up, happy Advent!! Yay, happy advent to you! Thanks for having the party - it's such a great idea. I enjoyed last year's one immensely. 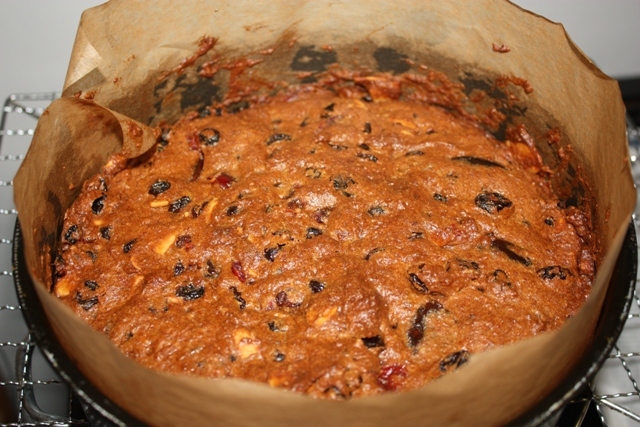 Throw loads of brandy into the cake when it's done to up that moist boozy-ness. Mmmmm!! I looks great. I can't wait to tuck in. How nice to find a vegan Christmas cake that looks so good, this will be our cake this year, hope it tastes as good as it looks. Thanks for shareing, Nollaig Shona. Elizabeth, hand on heart this cake is delicious. Promise!! Hello. I have inherited a vegan daughter-in-law so have recently been investigating recipes and have just baked a one-third version of your cake for her to have at Christmas. I compared the ingredients with our normal rich fruit cake and wondered why yourrecipe uses red wine vinegar rather than lemon juice which is more traditional, at least here in England. Do you think it makes a difference? Hi Mary, I adapted the recipe from a Rose Elliott one & it's what she uses. The bread soda & vinegar fizz up beautifully as raising agent. Thanks for your reply, Nuala. 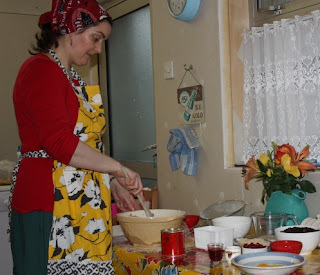 I have just given the cake a dousing of whisky, which she likes, and will wrap it up until nearer Christmas when I intend to decorate it with glazed fruits. That sounds beautiful, Mary. You're a lovely MIL! Lucky son and wife. Mine was/is undercooked this year and I really don't know what happened as I have been making it with great success for years. My husband is happy to eat the moist middle - I am sticking to the edges!! Nollaig shona duit - Happy Christmas! Just made your cake. I'm in France so delighted to find your lovely vegan Irish recipe on line. I did add some apricots, couldn't resist and used oat milk instead of soya (just because the carton was already open!) so will let you know how it turned out. That sounds fab, Patricia, I hope it's delicious! I too have made this cake - this will be my third year running and it's by far the best recipe I've come across. Thank you Nuala! Thanks so much to both of you for letting me know that you make and like the cake. It is a delicious cake, for sure, and one of my favourite things to make. Alas, only my husband and I eat it so I have been making a much smaller version of late.